creating world class ski facilities good enough to win the 2018 winter olympics pretty much from scratch is testament to korea’s amazing pace of development and can do mentality. so just how does it stack up as a ski destination? we sent carmen & owain price to find out. Incheon (Seoul) airport is your first inkling this is a country capable of doing stuff on a big scale. Basically it makes our departure point, Sydney, look 3rd world by comparison. It’s a lesson in attitudes too: in Sydney for 40 years every government, federal and state, from either side of politics, has stuck their heads in the sand about where to build a second airport. While in Korea they just reclaimed land from shallow bays and built a massive new airport, that’s not surprisingly a hub for huge economic growth.That can-do Korean approach is probably most obvious to the outside world in cars – they started as cheap, but now personally I find it hard to spot the difference between the latest Hyundai and BMW hatches, or know who is copying who on the styling front. Ditto for smart phones and tablets, Samsung being the only company seriously challenging the Apple juggernaut.In essence it seems there’s a national mission to do things better here. So when it came to starting a ski industry from scratch, in a country with lots of rugged, but not especially high mountains, and a very cold but generally dry winter without massive snowfall, I guess it’s no surprise they managed to do an amazing job of that too, with nailing the Winter Olympics icing on the cake.So as our Korean Air flight touched down (you guessed it, they do airlines pretty well too, and ours was no freebie in saying that, we paid, grabbing a cheap deal to do Korea and Sapporo on the same trip) we were getting excited to see what all the fuss was about. Massive airport, massive freeways, massive development, we had landed in the middle of an ant’s nest of activity that’s for sure. Shuttle transfers are swift for the 50km into downtown Seoul; you can head straight to the ski areas, 2 – 3 hours away, but the Boss said we weren’t getting to the snow without checking out the 24 hour shopping available in Dongdaemun’s multi-storey malls. That sorted, without too much damage to the wallet as most consumer stuff from clothes to electronics is cheap, the next day we were up early to see a red sunrise adding colour to the general chill grey mistiness of it all. Heading east to the mountains I lost count of the bridges over the wide Han river, with more going up or being extended. Again, thinking what a contrast with home in Sydney, where they have managed one new harbour tunnel in 50 years. I also lost count of the endless apartment towers. Not quite endless, as we moved into more rugged terrain they did space out, then finally stop, apart from scattered clusters on any large bit of flattish land. As the terrain gets more rugged further east from Seoul, light snow starts covering the ground, but long before that point we pass some smaller ski areas not far off the highway. Obviously it’s 100% man-made snow there, but equally obviously, they are fully functional and no doubt busy, especially for night skiing for locals escaping their apartments. The freeway climbed higher into Gangwon-Do Province, more natural snow appeared, and a couple of larger ski areas loomed in the distance. Freeway rest stops with bustling stalls selling goggles, gloves and other ski/board necessities were another good sign. Like the food at the same stops, it was all super cheap – if these guys ever set up in Cooma, or Mansfield, or Bright the local stores would be out of business in a flash. A massive ski jump tower grabbed my attention, and soon we were being given a tour – 6 years before the Games the jumping stadium is already in place, built for the recent Asian Winter Games. Looking down the ramp I’m thinking how long before someone blends your X-Games/London Freeze style Big Air with full scale jump ramps? Russ Henshaw would have ate it switch no doubt. I was getting vertigo just looking down. The jumps sit above the new ski area of Alpensia, which boasts a base village and superb hotels worthy of the latest in North American ski village design. The ski hill has only 191m vertical, 6 runs of increasing difficulty to cover the spectrum, and 3 six seat express lifts. How does such a small ski hill support such a large resort? Partly because the main market are beginner to occasional skiers/boarders at best, but more so because the ski hill is just one part of the entertainment equation. A humungous indoor water park, with wave pool, slides for up to 6 seater rafts, rubber kayakable rapids, and food court, is next to the ski base. People work hard here, and they want maximum bang for the buck in recreation terms. So a few hours on snow, a few in the water park and then relaxing in the hotels works for them. 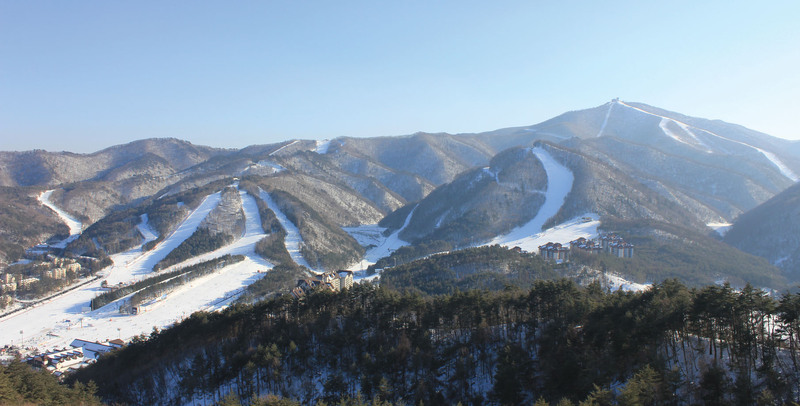 For western skiers it does offer the best and newest hotel selection, and there’s a shuttle link for the short trip round to YongPyong, but unless you’re a low intermediate skier YongPyong, Korea’s #1 resort, is the place to be skiing. ‘Wide YongPyong’ as the resort’s publicity trumpets – ‘wide’, as in ‘Wide Skiing!’, ‘Wide Boarding!’, which might be losing something in translation, but is understandable when virtually 100% of the country’s ski runs are carved out of tightly spaced forest, and rely on snowmaking for consistent cover. At YongPyong they certainly maximise that potential. The skiing sprawls across several peaks to provide by far the most varied terrain in the country, with the 6km Rainbow Paradise blue trail dropping over 700 vertical metres, and consistent fall-line black runs that include the Olympic Super-G course. Beginners get a huge base area that is, well, wide, and big enough to provide plenty of space. We hardly waited at all in lift lines midweek, apart from 10 minutes or so for the Rainbow Gondola, and most runs aren’t busy either. In fact the black runs are deserted, so you can hammer on those, especially the back face off the gondola which offers 4 variations over a 1000’ vertical. I lapped till closing here, just skating straight onto the express lift every time. It looked like when they do get fresh snow you could actually find a powder line or two there as well – most of the main runs are lined with 2m high cyclone fencing, so you wouldn’t be able to get off the trails anyway. Under the Silver Peak chair line there were a couple of old tracks too, so you could get lucky now and again, but with 250cm average natural snowfall per season and the tightness of the scrubby trees pow is not the main reason to come ski Korea. Why you would go is the whole Korea experience, including a Seoul shopover, the variety of groomed terrain, the modern fast lift networks, the convenience of slopeside lodging, the extras for kids like the water parks, the amazing value for money – $4 for a big lunch bowl, and maybe the lift hours – till 2.30am at Yongpyong. Plus it’s a great way to get to Japan, or Europe or North America for that matter, using Korean Air’s extensive network or their Sky Team partners, and get two countries on the one ski trip. This is one destination where it makes sense to use an operator that has done the research and can give you an honest assessment of the skiing, hotels, etc so you know exactly what you are getting. Mogul Ski World have done just that, we bumped into their team going around, and they have negotiated some great deals — like $582pp 2 share for a week with 6 day pass at Yongpyong, or $2799 for a family of 4 in a deluxe 2 bedroom condo at Alpensia including 6 day ski passes.